Coming in January next year is a collection of brand new never-seen-before Joe Hunter short stories that will be released by Hodder and Stoughton as an ebook via Amazon Kindle. Before anyone asks, no I'm not getting on the bandwagon of authors who are now releasing short stories onto Kindle as a way of making an extra buck (though admittedly it's not bad recompense) but that I wanted to share these stories with Joe's fans - old and new - in a wider format. Regular followers of my books and blogs etc know that I'm a voracious writer, and that when I'm not penning the latest Joe Hunter book I can't allow my writing fingers to settle and often come up with short stories or flash fiction. I share some of these stories here at the blog, or put them out into the world under pen names, but there are some I've held on to for some time - plus some brand new stories scripted for this collection - that deserve a wider audience. The collection will go out under the title "SIX OF THE BEST". No, it's not a spanking book, though there might be a few sore butts after Joe's done kicking them. The title comes from the lead story, and yes, there are six stories in total, so it's a double-header really. plus there will be sample chapters from the upcoming Joe Hunter 7 - No Going Back - to whet your appetite. I’m one of those authors that simply love to write and the medium isn’t as important as putting words on paper. Therefore I’ll write in any style that suits the story I’m attempting to narrate. Often it will be suited to a full novel, but as regularly a story can be told in much fewer words, and its as likely for me to come up with a Joe Hunter story as a flash piece or short story as it is a full novel. Writing a novel takes many hours of slogging away at the keyboard, but that doesn’t mean that a short piece is any less a feat of endurance. With a short the rules of structure still apply, but in this case there is less room for error, so it has to be that more concise. Words cannot be wasted yet characterisation, setting, plot and – for a Joe Hunter story – pace are still essential to the telling of the tale. In other words, penning an effective short isn’t an easy get out, in fact they can be more troublesome than writing a full novel where you have more ground to establish the finer details. The reason I write short stories is because they challenge me. I’ve written more than a dozen novels so I know I’ve got what it takes to deliver a full book. The novels are my bread and butter, my “must do’s”. However, with the short stories it’s different. I tend to write these as a form of enjoyment, and have fun with them along the way. It’s not unknown for me to pen shorts in different genres that include noir, crime, thriller, horror and sci-fi, but one thing that binds them all is that there’s a hefty dose of humour running throughout. That doesn’t mean to say that they’re laugh out loud funny, but that they have a quirk or turn of phrase, and I have fun coming up with a particular emphasis on a sting or twist in the tale. Often the story begins with a single word or phrase. Take the lead story from my collection “Six of the Best”: It’s an old English term that describes a form of corporal punishment. I couldn’t resist the idea of someone receiving their just desserts, I just had to find a way of incorporating the phrase into the narrative, without it becoming obvious from the get go. My Joe Hunter books are known for their fast-paced action, and with the Hunter short stories this remains true, where the phrases that influenced them help determine the forms of action. With this collection of stories I believe I’ve achieved what I set out to do. 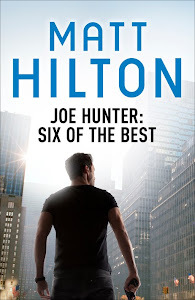 That is to deliver the same fast-paced action Joe Hunter’s readers have come to expect, while also being true to myself and having fun along the way. Hope you enjoy them as much as I did writing them. The collection - Six of the Best - will be available from January 5th 2012 (and for pre-order soon) and will be very competitively priced, and initially will go out in the Amazon Kindle format. Further news about other formats will be made available as I receive it. Good luck with the launch of these short stories - was doing this an LBA idea or something you came up with yourself? In March this year, when I posted about e-Readers and Kindles etc. on my blog, I had a number of disparaging comments from viewers declaring they would never give in to going electronic. Times change - and so many of those writing buddies seem to now be doing a quick u-turn to embrace technology! Anyway, Matt - I look forward to reading these short stories and hope they do well in this format! Whatever the future brings, we can't stand Canute-like against the tide of electronic publishing - I mean, look what happened to VHS! it was actually an idea I had for a paperback collection but the publishers weren't keen - I'm not well known enough yet - so me and LBA pitched the idea of an eBook to at least get the work out there, and perhaps help attract new readers. Hi Sue, long time no speak (my fault entirely). You're dead right and I was probably one of those decrying the new wave. But it looks like the eBook could have a double-edge. It is a way of attracting a new readership and in these difficult times, something that authors must embrace, or they'll likely disappear beneath the tide. I'm a paper book man myself, but I can't deny the future forever. p.s. I've still got some VHS tapes, some CDs, vinyl records and music cassettes on hold for when people see sense and return to the good old days. .....but what happens 'when the revolution comes and the oil runs out' and there's no electricity? Yeah, I'm still with you. I like my Nook, but Barnes & Noble need to get with the program and offer more British stuff. I like Kindle too, but why can't you buy British stuff if you live in the States? Surely it would be easy enough to send it wi-fi? Or is it a UK vs. US publisher thing? Yet, I can order a paperback in the UK and have it shipped over. I just think they need to tighten things up a bit. And it would help author sales! Anyway, best of luck with that new one Matt.